Salzburg is a hidden gem in Europe. Not as popular as some of the larger cities in Western Europe such as Paris, Rome, London and even its fellow Austrian city Vienna, Salzburg is definitely worth a visit. In a reasonably small area the city squeezes an astonishing amount of architectural beauty, amazing views over the surrounding hills, and culture. The birthplace of Mozart classical music always rains down over the city. A few more things to do in Salzburg include. 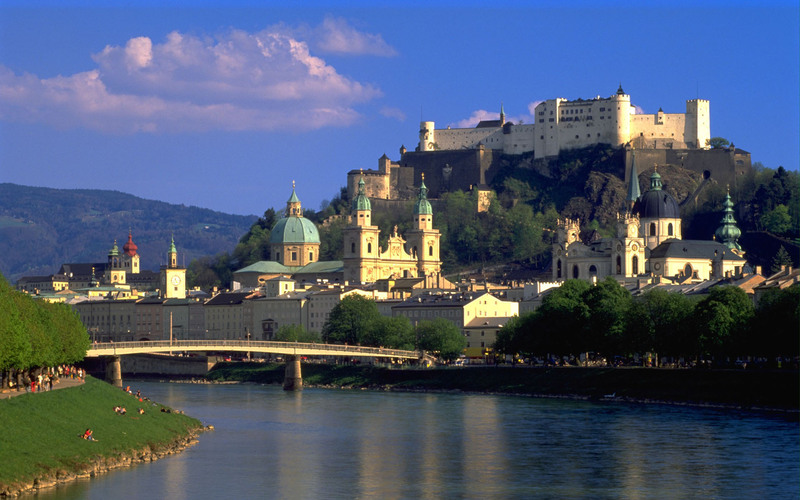 Originally constructed in 1077 as a defensive base for an impending conflict with Pope Gregor VII and Emperor Henry IV Hohensalzburg Fortress is nearly impenetrable and has never been conquered. In its existence as a building the complex has grown and held several different roles. At times Hohensalzburg was a prison, arm camp, and a military stronghold. Presently, subjugated from its original defensive responsibilities, the fortress displays to visitors its court yard, a torture chamber, and three small museums – the Fortress, the Rainer Regiment, and the Marionette. The interior of the fortress is still dressed lavishly elaborate door frames, gothic style rooms, and complex ceiling vaults. The top mounts of the fortress also make great vantages for snapping photos over the city. Open from 9:30 am till 5 PM entry costs around 10.50 EUR. Salzburg’s greatest son was Wolfgang Amadeus Mozart and a visit to the city requires a visit to his birthplace. The famous classical composer lived in this building from his birth in 1756 until 1773. The building is not a museum chronicling the musical prodigy’s early years. Items inside his birth home include his childhood violin, portraits, and family letters. The building is separated into three floors and periods: Mozart’s family and birth are chronicled on the 3rd floor; his opera composing period on the second, and insight into his family life on the final ground floor. You can visit Mozart’s Birthplace any day from 9 am until 5:30 pm the entrance costs 7 Euros. In a city filled with as much culture and delight as Salzburg naturally there is a museum that houses many of the city’s artifacts. Salzburg museum has several artistic treasures that include a 17th century carillon that plays Mozart, Renaissance painting and artifacts from Salzburg’s Roman beginnings. Housed in a beautifully ornate building many feel one of the best attractions of the museum is the very building itself. Since 2006 the museum has been houses at Altstadt inside the Neue Residenz which was an extra housing complex for palace guests, advisors, and diplomats. Salzburg Museum is open daily from 9am until 5 pm and tickets to enter the museum cost around 8 Euros.